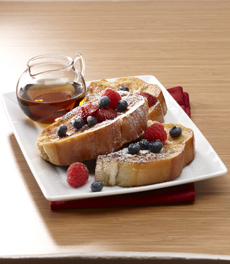 Eggnog French toast looks like the regular kind, but packs a punch of extra flavor. Photo courtesy Spice Islands. Save some of tonight’s eggnog for tomorrow’s French Toast. Eggnog is substituted for the milk that’s normally beaten with the eggs. With this recipe, from Taste Of Home, prep time is 10 minutes, cook time is 20 minutes. For an even eggier flavor, use challah or brioche instead of conventional bread. 1. BEAT the eggs, eggnog, sugar and extract in a bowl. Soak the bread in the mixture for 2 minutes per side. 2. COOK on a greased hot griddle until golden brown on both sides and cooked through. 3. DUST with confectioners’ sugar if desired, and serve with syrup and optional berries.